We all have skeletons in our closet, right? Some might be bigger than others, but we all have little things we are not proud of. Well for me, one of those skeletons is covered in quilts. I actually I think I heard it give a muffled cry from under a large stack of quilt tops that fell on it. Today is the day, I'm ready to air all my quilty skeletons in hopes that during the next year I can give them life. I think I actually made this same declaration last year, but I mean it this year, and I hope you will join me. UFO's--if you are an unquilted quilt top and you live in my house, you are a UFO. Sorry, just a fact. Unless you went from my Viking Sapphire straight to my Sweet Sixteen, you have been skipped over for some other shinny object or squirrel. It's not that I don't love you, I just think we need a break from each other. WIP's--if I have chopped you up, or started stitching you together, and have left you abandoned in a plastic tote due to a distraction or maybe I'm waiting on more instructions to finish you, you are a WIP. Some things must marinate before they can cook. Kits--you are fabric that I purchased with a specific end result in mind. You are my fantasy quilts. I pull you out occasionally and drool and pet you. I hope that one day I will turn you into a finished quilt. No WIPing and no UFOing. Now that that is out of the way, I created myself a step one, in gaining control of my problem. How can I hope to finish the quilts I have, if I'm not honest with myself and acknowledge how many there are and what they are? So that is where I begin. I made myself a list in excel of all the quilt tops laying around the house (both mine and David's) that need quilting. I also took pictures and measured each quilt. I realize that might seem like a lot of work, but now, I know what is out there, its size and can see a quick picture to jog my memory. Fifty-five quilt tops (ranging in all sizes) is a lot to remember. You read that correct. 55. I haven't listed them here on the blog (that would take forever) but I will slowly introduce them to you over the next year. on top of this tote if they are already basted. Well, Wayward Transparency isn't basted, but I was too tired to climb a stool to the top of the bookshelf. So that is the state of my sewing projects. Did I miss anything? Probably. Am I going to beat myself up if I have? No. I'll just add it to the list and move one. The point is to have fun and create finishes and I'm really looking forward to that. I am going to release any guilt I feel for creating such a mess of projects. So how did you fair in your hunt for your UFO's? I hope your numbers are smaller than mine (okay a little part of me hopes someone has more than me). I look forward to working with everyone in busting our UFO's! Holy Hell Tish!!! I cannot believe you have 55 quilts in various stages! I'm so curious to see what other people have stacked in their sewing rooms. I wonder if that is normal!! LOL! You'll work through them especially now that you've held yourself accountable and told the whole quilting world! There was a time when I would piece and quilt before I started another, these days I get a few stacked up before quilting can happen. I'm in awe of your quilt making stamina! You are an amazingly productive and active quilter, Tish! I personally only have my Honey Pot Bee blocks and my Meadow Mystery Quilt hanging out in a WIP state at the moment along with the next few fantasy quilts. I look forward to seeing you bring your projects to life; it's always inspiring to see how you quilt and finish your work. OK so I honestly read the title wrong and I thought it read, UFO Addiction. Your photos kind of overwhelmed me. At this time I have 18 projects that are by your standards, a kit, a WIP or a UFO. It's going to be fun to read about how you bust through this pile. I don't think you should have to count Dave's quilts in your list. He should have his own list. I think I have 5, all pieced, 2 need borders, and the Wayward Transparency is not included as I have not sewn the 4 parts together yet.55!!! Hugh would either faint or evict me if I had that many down here!!! Eviction might be the answer, and I would find a new home with a HUGE room that the Gammill frame will fit into. Roll on 2018 for us all, finishes, new QAL, and our blog friends as always to keep in our minds and hearts. WOW! I knew you were a production ninja but I had no idea! This will be a fun year to watch what you get quilted up! I have not yet counted mine up but I will try to do that this week and get linked up to your party. I think it's about 12 to 15 counting all three categories you mentioned. Ok I had to read that twice 55 OMG. You and David sure have been busy. I haven't pulled all of mine out and assessed them yet, but I do know I have at least 8 larger quilts that would qualify in the UFO or WIP categories. I have several little quilts that just need to be quilted and finished; those are the ones I need to unearth. We can do this! Thanks for doing this, Tish! Wow, some UFOs. I think I will call you whirlwing Tish from here on in. =) This is amazing. Next year will be an opportunity to meet old already pieced friends of yours as you slowly pull them out and introduce them to the world. Looking forward to that. Me... uhm... a sampler quilt and a divisible squares quilt still in pieces, various quilting bee quilt tops to be finished, baby quilt, tesselation pillowcase... yup ... there are a few things that want doing. I feel like pleading the Fifth but your linky party is a good way for me to confess. When do we have to post by, I need a little time to gather my thoughts. Also, I think Dave's quilts should not be on your list too. Now I don't feel so bad! 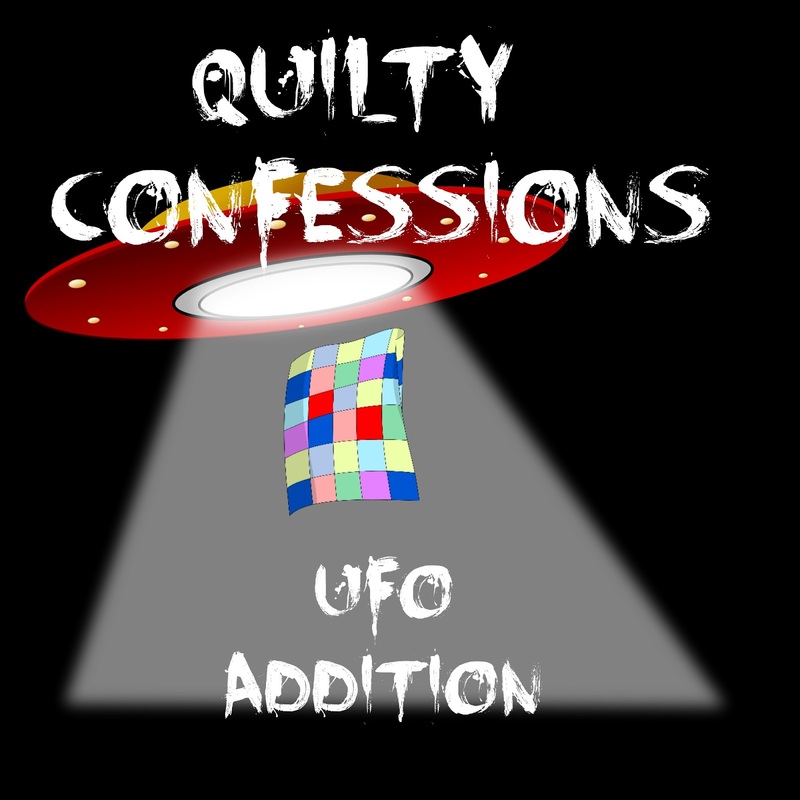 55 UFO quilt tops. On the other hand, you sure enjoy piecing quilt tops. And now you'll get a lot of practice on the longarm. Who is going to be getting all these quilts? It always cracks me up when folks freak out at our high numbers. :) This is a great post. I had collected kits and started-and-put-away quilt projects over some 25 years while my kids were young and I frequently froze at some crazy inarticulated compulsion for achieving absolute perfection. . . You know how it goes. In Jan 2012 I first listed all my unfinished projects. Those were the ones readily findable, anyway. There were 58 of those in various stages. 41 of those are completely finished now, and 9 of the remaining 16 are flimsies waiting to be quilted. When we moved later that year, I itemized every single untouched kit and grouping of fabric that came out of the woodwork (stuffed in distant closet corners, way under beds, etc.). That list ended up at 93, counting Christmas panels and such, as well as several quilts of my cousin's who had died at 45 years of age that I wanted to finish for her. Of those, 5 are completely finished, 11 are flimsies, and another 19 have had some work done on them. I use my blog and link-ups to keep myself working regularly on these lists, and also allow a little "Fresh Play" from time to time when something particularly calls to me, or I need a gift that I don't have anything fitting to apply to. 2018 is poised to be a super highly productive year for a whole lot more of these lists to get completely finished. Thanks for your link-up - a great moment for me to review where I started, how far I've come so far, and checking my organization approach to see if I want to change anything. :) Making my list and blog-basing it like you are doing right now, and truly internalizing the concept that "Finished" is far better than "Perfect" (but also holding myself to do my Reasonable-Very-Best is what changed me around from a floundering starter and into a thriving finisher. I don't look at my whole list regularly, because that would be too daunting. I choose a given number at a time to make check-lists to motivate by. (Which is what fuels my 18 in 2018 approach.) Man, I didn't mean to chat so much here! I just already had a post page to link, but that didn't give me the opportunity to address your particular link-up. As I said to Lynn at What a Hoot: I've taken a different approach - kind of like Judy Laquidara use to do with her stash reports - just count what you've used and what you've added. So yes, I have a lot - not as many as Lynn or you, Tish, but I'm going to count only what I've worked on or what new project I've started. I have put together a list of some I want to work on for 2018 - 18 at this point. But who knows what I'll add to it. Let the New Year's quilting begin! That's quite the list. My list pales in comparison LOL But I missed the link up. Good luck with all your projects. I like how you categorize projects.